In most practise situations a half tennis ball is more useful than a jack. Used instead of a jack it wil not ever move to the wrong place. They also can be used for all sorts of marking situations for coaching exercises. Get a supply from a local tennis club or buy them for about $2 for six from your local cheapie shop. The next most useful device also costs very little. Obtain some off cuts of thin rigid plastic sheeting (up to 1.5mm thick?) in white or a bright colour. Cut them into small rectangular pieces (about 100mm x 300mm). These are then used for many purposes, mostly to mark positions on the green where bowls should pass. Because they do not affect the path of the bowl they are much more useful than the more commonly suggested old DVD and CD discs. Find some small different coloured markers which can be used to indicate target areas on the green. If your club has some old cloth mats guard them carefully. When you need to put out 20 mats for a coaching exercise modern plastic mats are very heavy. The coloured bowl disks and white jack disks stay put when hit and are useful for much more than driving practise. Prepare a brochure and distribute through a direct mail organization - I recommend Australia Post. The brochure needs to be properly designed (we used Elance). If your club offers non bowling services to the local area (ie meals, gaming, venue hire), quality advertising for these services delivered to every letterbox in your area will be worth far more than the total cost of the brochure and distribution. Do the grind of four or five sessions. Costings You should be able to break even on the course, and if you get 25% of trainees joining your club you will be way ahead after the first year. Income 80 at $50 $4000. We received a grant which meant we ran at a slight profit. 21 students became members. Every person who enjoys a social day on your greens is a potential member of your club. If there is a night where your bar is open anyway and you have willing coaches then a bowls parties are very easy to organize and can be offered to corporate groups, family groups and small business and school groups. My club offers them on Friday nights at $12.50 per head for bowls and a finger food supper. A coach attends each session with responsibility for getting out the equipments, very basic instruction and safety. The caterer provides the finger food at the time requested. If your local schools are interested and you have trained and approved junior coaches then your club should welcome school groups coming with teachers and helpers as part of their Physical Education program. Do not overdo this type of visit. The ideal program for an introduction to bowls for children aged 12-16 consists of 2 to 4 sessions of 60-80 minutes. Whether you have been approached by one player or are taking a small group of up to six many of the same techniques will be used. While everyone may have a different action and different ways of getting green and weight, every bowler will benefit from getting onto the mat in this way. About half of all club bowlers do not get on to the mat in a consistent manner. Set up two flat plastic markers 15cm apart 10 metres from the mat so that your student's bowl should pass between them for a good green. Get the student try to put 4 bowls through the gap, then adjust the markers so that a bowl through the gap will have perfect green. Diagnose faults which may be causing errors. You now know the size of your task because if the student can not aim a reasonable percentage of bowls through a gap 10 metres away there are problems to be solved. For using the bank the long lines we currently use in most clubs are very helpful. The spot on the green will be a given distance from the end of the line. (2) Discuss how the player varies weight and use activities to test this. Provided wind conditions do not change on each side of the green there is one angle at which the bowl must be delivered for it to finish on the centre line. 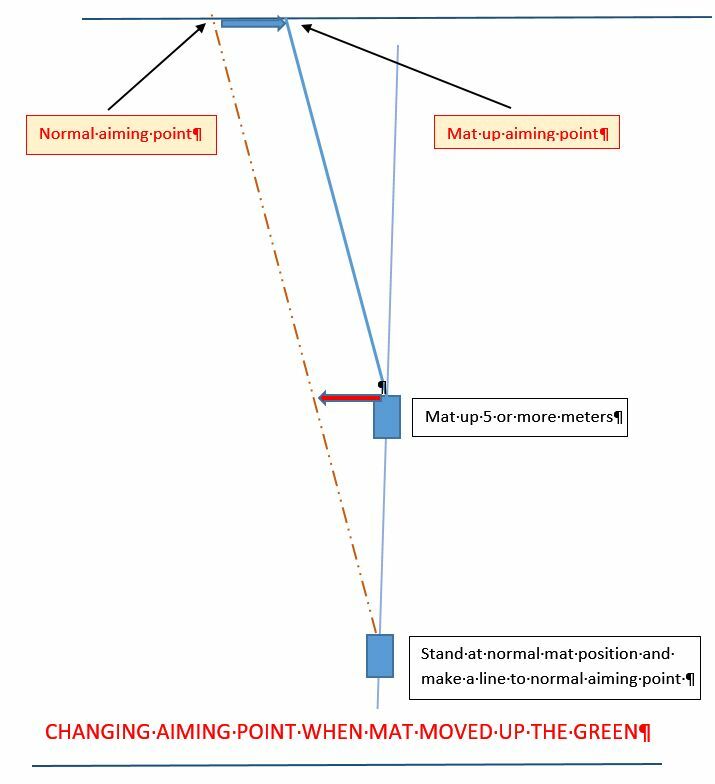 Most bowlers find their green from a point on the bank (hence keeping the angle fixed unless the mat position changed). Most ends of bowls are played with the mat between 1 and 4 metres of the T, and on the trial ends the mat will usually be in this normal range. Look at your aiming point. A bowling dilemma: How do you use the mat to get around a bowl? A few years ago I had a problem. Most of the books on bowls I had read told me that to get around a bowl which you believe is on your draw line, you move across the mat as far as you can to the opposite side. That is a right hander moves to the left for a forehand and to the right for a backhand. As a long term coach I always taught the textbook method if an experienced bowler asked me. Getting around a bowl using this method will only work if the bowl you want to go around is in the last quarter of the path to the head. The new path crosses the old path at about 70% of the run. My testing of this showed that the margin for error is very low and hence I believe that it may be better to also add a few cm to the aiming point when using this method. Both methods work! but BOTH METHODS PRESUME THAT YOU WILL BOWL WITH PERFECT GREEN AND WEIGHT. There is probably no point in even mentioning these methods to beginning bowlers. However what is mostly required is confidence in your actions so that you maintain your perfect weight and green. Over the years I have been surprised how often using one of these methods works for me, given my moderate draw bowling ability, the small margins involved, and the likelihood that the offending bowl may not be exactly on the normal path. Perhaps it succeeds because it forces the bowler to concentrate harder than usual on delivering that bowl. Among bowlers opinions vary about individual practice. Here are the reasons why you should put down many more bowls in practice than you do in competition. If you are a lead or a second almost all of your bowls are draw bowls and the more bowls you put down the better. For thirds and skippers 90% of bowls are draw bowls because the only time you do not bowl a draw bowl is when you aim to finish in the ditch. As a third or a skipper very often you do not see where your bowl would have finished because it hits other bowls. If you play regularly in those positions and do not make the time for individual practise the quality of your draw bowling may decline. When practising a skill (eg yard on shots) by yourself you can keep repeating the same shot until you get it right. Many players practise by rolling up with a few mates, putting a jack at each end and bowling four bowls in turn. Some when practising by themselves set out a jack at each end and bowl four bowls without varying length and side and mat position. These types of practice are not very useful. If you have only a short time for draw bowling practise use three half tennis balls as jacks, placing two at one end three metres apart and one at the other end. Walk your mat. Starting at the end with the single jack, deliver two bowls to the longer jack on one hand, two to the shorter jack on the other hand. Put your mat in front of the shorter jack and deliver two bowls to the single jack, then move it to the back jack and send down two bowls on the other hand. Do this up and back four times and in less than more than 30 minutes you will have given yourself some excellent draw bowling practice. First end: bowl full length to no jack, and then take off two metres with each of the next three bowls. Do this in each direction (8 bowls). Roll a jack then a bowl using the same weight as you used for the jack (you should use the same delivery for the jack as you do for the bowl). Do this three times, long medium short. Compare the finishing positions of the bowls and jacks and so work out how to alter your delivery between bowl and jack. Draw with your other bowl to the longest jack Do this in each direction (8 bowls). Place a jack at one end and a marker about 2 metres shorter and a jack at the other end. Place the mat and bowl twice at the long jack and then twice at the shorter jack staying on same side of green. Change ends, place the mat in front of the shorter jack and bowl twice at the single jack on same side. Then move the mat back to the longer jack and bowl twice, staying on the same side of the rink. Repeat (16 bowls). Vary the placement of the mat each time. AIM two bowl draw practice, second bowl should beat first bowl! AIM:four equally spaced bowls on the centre line, finding green and establishing control of weight. Place a jack near the six foot spot and a marker at one end at least three metres apart and one jack at the other end. Place the mat and bowl twice at the long jack and then twice at the short marker. Change ends, place the mat in front of the shorter marker and bowl twice at the single jack. Then move the mat back to the longer jack and bowl twice. Repeat three times, varying the mat position . (32 bowls). Initially bowl both bowls on the same side, later bowl one bowl on each hand. At each end of the rink place one marker or rebound bowl 30cm from the jack in a jack high position, and another marker 1 metre back and 50 cm narrow. With your first bowl on each end try to draw within 30cm. If you are not satisfied with your first bowl try again. With subsequent bowls try to achieve a yard on bowl through the gap or turning out your first bowl by slightly increasing the weight and reducing the green. This is best done by making the back marker your jack (depending on the width of your bowls): repeat three times (24 bowls). At one end place a jack near the six foot spot and a marker three metres away and one jack at the other end. Place the mat and bowl twice at the longer jack and then twice at the shorter marker WITHOUT CROSSING THE CENTRE LINE. Change ends, place the mat in front of the marker and bowl twice at the single jack. Then move the mat back to the longer jack and bowl twice. Repeat three times. (32 bowls). Initially bowl both bowls on same side, later bowl one bowl on each hand. When you have a side or club practice a circuit is the ideal way for each bowler to warm up. The coaches can do the circuit themselves and stay around to help the players with the skills required on that day. You can use 2 or 4 bowls, but four is better because most of the circuit will be testing specific skills. Circuits take a lot of space for the number of players using them, but you can get around that problem by using half rinks. For example on a North South green every bowl is put down on the Western side . Each activity is repeated so that every bowler delivers four bowls on each hand at each activity. Everybody gets to put down twice as many bowls in the time available. Set out circuit type skills on 16 rinks. Provide players with instructions and scoring cards. Allot four players to each rink, playing four bowls. Two play and two score and then they swap. Players are scored on each of the skills and keep their record, and then move to the next rink. Coaches are allocated to certain rinks and provide help and instruction. Put a mat at each end and mark out a "scoring zone" ie a 1 metre square with two flat plastic markers at the front and two other markers at the back, with a half tennis ball as the jack at the centre of the square. One mat one jack, two bowls from each player stay at the head. Take turns to be director of the head. The director sets up an end using the jack and the eight bowls, and gives direction to the other three bowlers who get two chances to play the required shot. The director them rolls the 6 bowls back and changes the head and gives new instructions. In 2007 I decided to replace my bowls. My first move was to look for information on the internet and searched the names of each of the available brands and versions. The amount of information available in discussion groups and blog sites surprised me. After some time I decided that one brand and type might suit me and I spent as couple of hours reading all of the posts about these bowls. Every bowler who had bought them had nothing but praise for them, and most people who did not actually own them complained that they should be illegal! I decided to look investigate the advantages mathematically and wrote this article. I tried out a set of these bowls and was astonished to find that my aiming point for the new bowls was always just less than half as wide as my aiming point for the ABT2000 bowls which I had used for about 8 years. When I bought them, the ABT2000 was considered to be a somewhat narrow bowl. This led me to examine the advantages which should theoretically follow if I changed to the narrow bowls. WHY SHOULD NARROW BOWLS BE BETTER? If the aiming point is half as wide for the narrow bowl, this means that the distance moved across the green by the narrow bowl will be half that of the wider bowl. Hence the average green error should be halved. If, for instance, my average delivery with the wider bowls finishes 30cm from the centre line, my average with the narrow bowls should be 15cm from the line. The average distance to the jack with a jack high bowl will be halved, but Pythagoras theorem will reduce the percentage saving for bowls with imperfect weight. For example for a bowl finishing 20 cm wide the improvement by halving this to 10cm is 10cm for a jack high bowl (50%). A bowl one metre long or short and 20cm wide is 102.1 cm from the jack while a bowl 1 metre long or short and 10cm wide is 100.5 cm from the jack, an improvement of 1.6cm (less than 2%). Since the weight error will decrease considerably as skill level increases we would expect to that the percentage reduction in distance from the jack will increase with the skill of the bowler. The measures of the increasing skill of bowlers below are are guesses - no foundation in fact!! It is logical that the error in weight of a delivered bowl will be related to the distance the bowl travels. It is hard to calculate the length of the path of a bowl mathematically, so I used a scale drawing and string to estimate the difference in length of path of wide and narrow bowls. In a 28 metre end a wide bowl reaching a point 5 metres wide and finishing on the centre line rolls 31.5 metres. A narrow bowl reaching a point 2.5 metres wide and finishing on the centre line rolls 29.2 metres. Hence since the length of path is reduced by 2.3 metres or 7.3%, changing to the narrow bowls should cause a similar reduction in the weight error. This reduction should be the same for bowlers of all skill levels. When the reductions in the green and weight errors are compounded the improvement in accuracy will range from 18% for less skilled bowlers to 25% for highly skilled bowlers. - IS IT HARDER TO CONTROL THE WEIGHT OF THE BOWL WHEN USING NARROW BOWLS? Your aim is to get 3 bowls within a mat length of the marker- I say I will go home if I ever get all 4 within a mat length! Use this practice for 30-45 minutes initially, varying the mat position. As you develop more skill reduce the distance between the markers. This is a routine for all bowlers but particularly for 3rds and skippers who need regular weight control practice because many of their bowls will hit other bowls before stopping.